Adopt a midwife | Please donate! While you are reading this, every two minutes a woman dies during pregnancy, while giving birth, or right after giving birth. 99% Of these deaths happen in developing countries. These deaths mainly result from a lack of sufficient and qualified midwives (source: World health organisation, UNICEF). For this reason, the ‘Adopt a Midwife’ Foundation has a very simple and practical approach: providing scholarships to young people who wish to be trained as midwives. The Foundation, established in 2009, aims to reduce maternal mortality by offering a very practical approach: providing scholarships to aspiring midwives in developing countries. The Foundation brings healthcare closer to mothers and children. The ‘Adopt a Midwife’ Foundation is an initiative of Roos Ament. 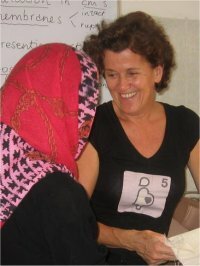 Roos is a midwife and has worked with Doctors Without Borders and local health organisations in Ethiopia for 7 years. 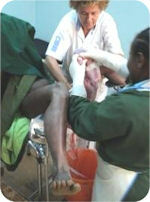 The Foundation works in collaboration with the St. Luke’s Hospital and Nursing College in Woliso, Ethiopia. There, Roos Ament provides training in Safe Motherhood (safe labour). The Foundation aims to improve obstetric care in Central and Southern Ethiopia. To achieve this, the Foundation selects 5 to 10 students each year who will receive a scholarship to follow a midwife training at the St. Luke’s college for Nursing and Midwifery in Woliso, Ethiopia. After obtaining their degree, the students return to their home towns, to work in this region for a longer time. To contribute to the reduction of maternal mortality (MDG 5) by improving obstetric care, especially in the rural areas of Ethiopia. Every year, 287.000 women die during pregnancy, while giving birth, or right after giving birth. 99% Of these women live in developing countries. The main causes of death are blood loss, infections, and high blood pressure. One third of all deaths are a result of unsafe abortions. Ethiopia has one of the highest rates of maternal mortality in the world. Only 6% of Ethiopian women are assisted by professional trained midwives during childbirth. Solutions to reduce maternal mortality are: training more midwives, presence of emergency obstetric care and access to a safe family planning. Reducing maternal mortality is Millennium Development Goal (MDG) 5. In 2015, maternal mortality should have been reduced by 75%. Unfortunately, progress on this goal lags behind expectations. MDG 5 is closely connected with other goals, such as the MDG 2, to achieve universal primary education. When girls stay in school longer, it becomes less likely that they will die during pregnancy, while giving birth, or right after giving birth.